We base our educational project in the Montessori pedagogy that focuses on the individual development of each child / y in the absolute belief that the child / a can better develop their skills and values ​​to the extent that the social environment in which develops is suitable for learning. There are over 22,000 Montessori schools in the world. It is more applied pedagogy worldwide. And we have more than 100 years of experience. We propose a physically and emotionally safe respectful and stimulating environment that invites the child to explore and actively participate to fully develop their unique potential. We started the project with the opening stage of House of Children (Children’s House) and mixed-ages ranging from 2 and a half and six years of age. It is the environment and the rooms prepared for montessori children with a complete interior environment with a prepared environment outside. 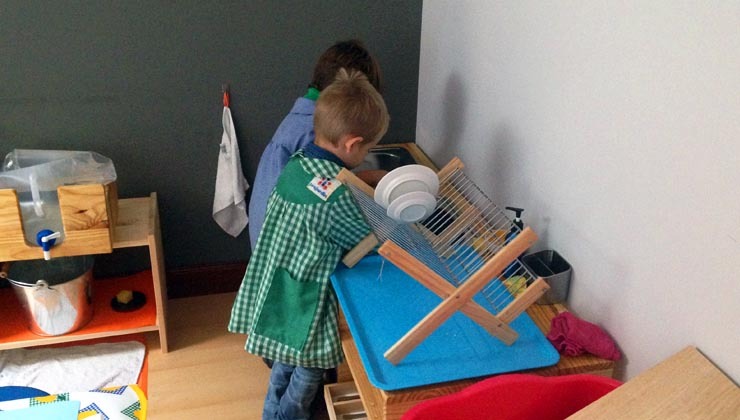 With all the development of Montessori materials appropriate to age. We also have a room psychomotor and rhythmic and bodily activities. Natural and organic food. The mealtime is family time when children enjoy a relaxed meal and time in which we thought a meal with this being the highest quality organic and locally and promoting taste education. Bilingualism. In our environment there is a guide who speaks English all the time with the children in the classroom. And another who speaks Castilian only. Other activities. We started with a Laboratory of Elementary ages 6-9 years. We offer extracurricular activities in the afternoon. In addition to outings and organized tours. Our forecast is to open Montessori School Almeria Workshop I-II as a continuation of our Elementary students in the year 2016/2017. In this sense we are working on the accreditation of foreign school.